Bardia National Park, in the southern lowlands of the far west, is Nepal's largest and most undisturbed wildlife area. Bardia was a hunting reserve for the Rana Dynasty. Today it has one of the last known herds of wild Elephants in South Asia and also boasts six deer species. Bardia has some 300 resident and migratory bird species. Remote, Challenging and offering unique adventure for wildlife and nature lovers, wilderness is the relatively unexplored deep jungles of far western Nepal, where wildlife is more that abundant. Initially a Royal hunting reserve, the Royal Bardia National Park was gazetted in 1976 as Royal Karnali Wildlife Reserve with an area of only 368 sq. km in 1982. It was renamed as Royal Bardia Wildlife Reserve, which also included the Babai River Valley. It was only in 1988 that is was granted a status of National Park in order to preserve the dwindling species of rare ecosystem, including flora and fauna, particularly the tiger and its other prey species. This park is the largest and most undisturbed wilderness area in the Terai providing excellent habitat for most of the endangered species of wildlife and birds. The park now covers an area of 968 sq. km. It was only 1994 basic facilities existed for independent visitors. It has extensive and varied wildlife-all endangered rhinoceros, Wild elephants, The Royal Bengal Tiger, Swamp deer, Black buck, Gharial Crocodile, Gangetic Dolphins. More than thirty different mammals, over 400 species of birds, many snakes, lizards, and fish have been sighted and recorded in the park's forest, grassland and river habitats. Among these include, Langur monkey, common leopard, and Jungle cat, fishing at, large and small Indian civets, mongoose, hyena, wild dog, and jackal. Sloth bear, otter, porcupine, bandicoots, blue bull (Nilgai), Sambar deer, hog deer, barking dear, wild boar etc. 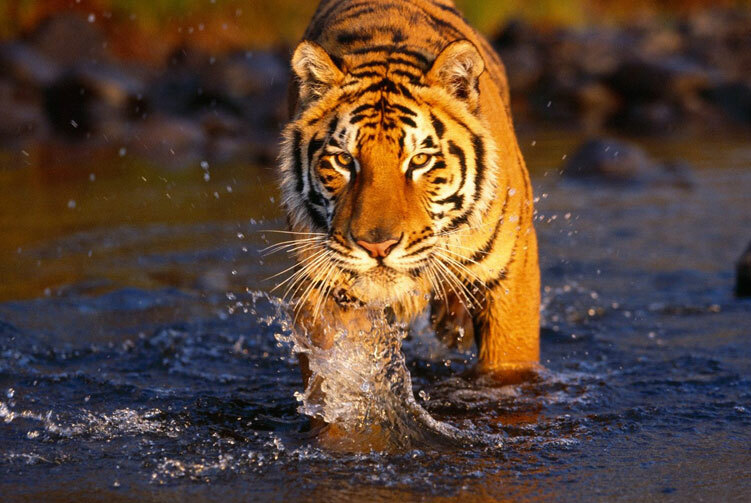 This park is one of the best places to view the most magnificent of cats, The Royal Bengal Tigers. The chances are almost 80% depending on the season. Rafting in Wild Karnali River. Day 03: Drive to Bardia National Park, Overnight in Lodge. Day 04: Whole day walking safari to view Gangetic Dolphins and swimming also possible, Overnight in Lodge. Day 06: Rafting in the flat Karnali and visit to Baghurphanta watching tower and grassland, Overnight in Lodge. Day 07: Bird watching tour, Drive back to Kathmandu, Check in Hotel. Day 08: Bardia Wildlife Safari ends/ Transfer to Airport for Final Departure. We offer you the best price guaranteed for Bardia Wildlife Safari. The Bardiya (Bardia) National Park is a protected area in Nepal that was established in 1988 as Royal Bardia National Park. Covering an area of 968 km2 (374 sq mi) it is the largest and most undisturbed national park in Nepal's Terai, adjoining the eastern bank of the Karnali River and bisected by the Babai River in the Bardiya District. Its northern limits are demarcated by the crest of the Siwalik Hills. The Nepalgunj-Surkhet highway partly forms the southern boundary, but seriously disrupts the protected area. Natural boundaries to human settlements are formed in the west by the Geruwa, a branch of the Karnali River, and in the southeast by the Babai River. The wide range of vegetation types in forest and grassland provides excellent habitat for 642 faunal species. 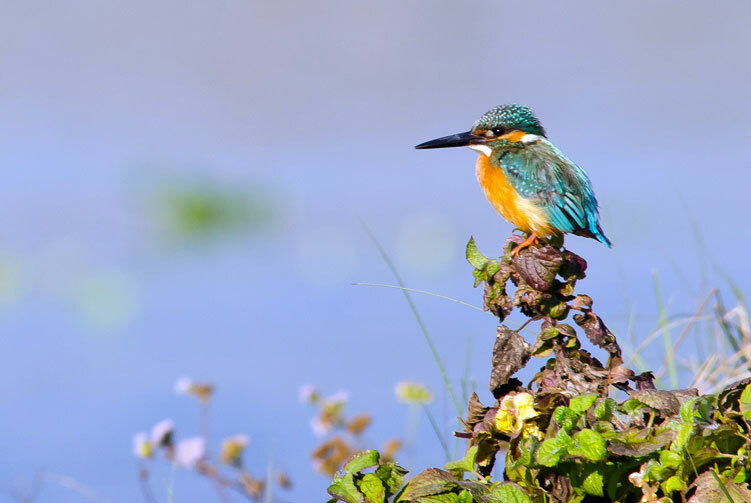 The Karnali-Babai river system, their small tributaries and myriads of oxbow lakes is habitat for 125 recorded species of fish. A small population of gharial inhabits the rivers. Apart from the mugger crocodiles, 23 reptile and amphibian species have been recorded. The Bardiya National Park is home to at least 53 mammals including rhinoceros, wild elephant, Bengal tiger, swamp deer, and Gangetic dolphin. Rhinoceros: Translocation of rhinos from Chitwan to Bardia National Park commenced in 1986, with 58 individuals relocated until 2000. From 1994 to 2000, hunters have been unsuccessful at poaching rhinos. 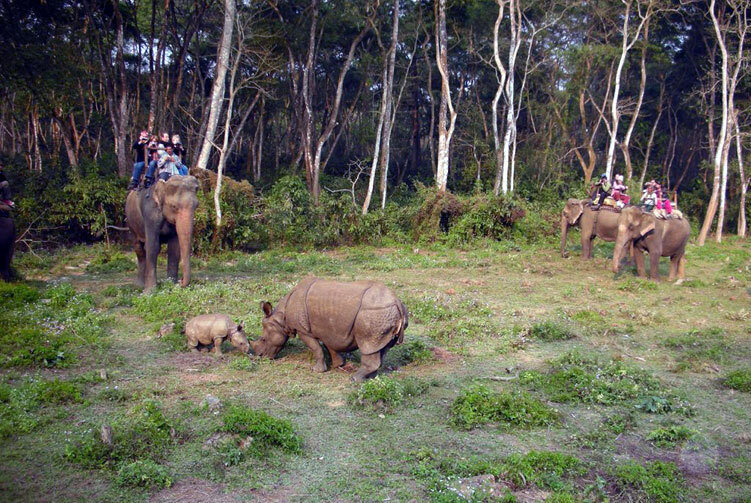 In April 2000, there were 67 rhinos in the park, most of them resident in the Babai Valley. In May 2006, a reconnaissance survey was carried out in the Babai River floodplain, which revealed an alarming decline in the rhino population. Poaching was suspected to be the main cause of this decline. Subsequent surveys in 2007 and 2008 have confirmed the complete disappearance of rhinos from Babai Valley. In different habitats of the Karnali floodplain 25 rhinos were recorded based on direct observation and indirect signs of rhino dung and tracks. They were mostly congregated in the floodplain grassland, riverine forest and wetlands. In March 2008, only 22 rhinos were counted, and two of them have been poached since the count. Elephants: In 1985, two large elephant bulls were spotted for the first time in the park, and named Raja Gaj and Kanchha. They roamed the park area together and made occasional visits to the females. Raja Gaj stood 11.3 ft (3.4 m) tall at the shoulder and had a massive body weight. His appearance has been compared to that of a mammoth due to his high bi-domed shaped head. His forehead and domes were more prominent than in other Asian bull elephants. In 1993, five elephants were seen entering the park, and one year later another 16 individuals arrived. A population count in summer 1997 revealed 41 resident individuals.In 2002, more than 60 individuals were estimated to reside in the Karnali floodplain and the Babai Valley.